A Torrington man is accused of hacking the system of a mortuary science school and forging paperwork that would qualify him as a licensed mortician, according to court documents. Jonathan Ryan, 22, was charged with second-degree forgery and second-degree computer crimes after police said he forged documents to make it appear like he graduated from the Mortuary Science program at Lincoln College in Southington. Ryan then helped prepare dozens of bodies for burial at Gleeson-Ryan Funeral Home, which is owned by his father. Last year, the director of the school, Dr. Paul Warren, contacted state police to investigate possible forgery at the school in June. Warren said that Ryan had created a fake Lincoln College transcript by forging the college seal and registrar's name on a transcript in May 2015. 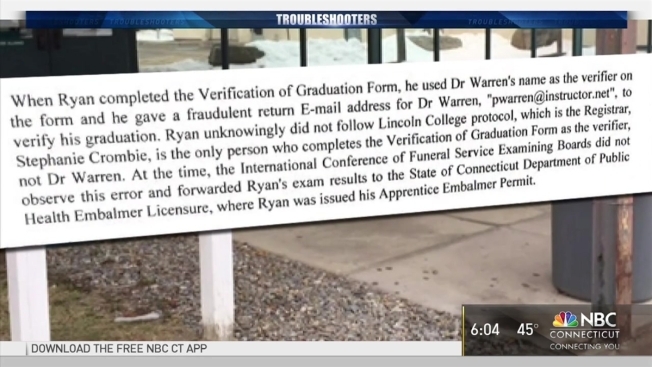 Ryan also created a fake email address for a professor so he was able to get an apprentice embalmer's permit from the Connecticut State Department of Public Health. Between sometime in 2015 and 2016, Ryan worked embalming or assisting in the preparation of roughly 60 bodies for burial at his family's funeral home in Torrington. State police said Ryan's father Christopher Ryan told investigators he did not know his son obtained his credentials improperly. Ryan said the reason he forged documents to become a mortician apprentice was actually part of a two-person investigative journalism project, according to arrest warrant documents. "I find flaws in unsecure websites and human processes and my partner converts my findings into wonderful articles. We have been working on this little project of ours for over two and (sic) one half years, with little success until stumbling onto your website. It is mind boggling that you would leave such an important form, the Verification of Graduation and Projected Graduation Date forms, COMPLETELY (sic) unsecured. There was no password, there was no authentication, and there was no oversight for 6 (sic) months." State police did find that Ryan attended Lincoln College from Sept. 4, 2013 to Dec. 1, 2013, but never got his degree. Neither Lincoln College or the Gleeson-Ryan Funeral Home returned NBC Connecticut calls for comment.